sunset | Where is Whitney? 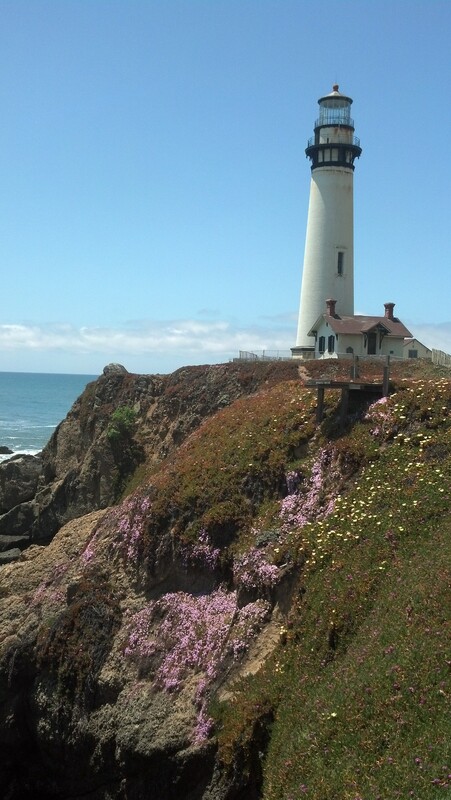 Absolutely beautiful and relaxing, the Pigeon Point Lighthouse Hostel is located right over the cliffs from the beach. It is known for its hot tub overlooking the water. The view is amazing. I enjoyed eating dinner and having a few beers with some of the other hostellers. I met lots of interesting people: a lady from the area, coming back after a long time, two guys bicycling the coast and some girls from Europe. Flowers grew all along the cliffs. I heard that many of the flowers are actually non-native and that they were planted there to prevent erosion. It was breathtaking. Posted in California, Food, Nature, Pacific and tagged affordable, Beach, Big Sur, cheap, Flowers, historic, HWY 101, Lighthouse, lighthouses, Pacific, Pigeon Point, restaurant, roadtrip, solo, sunset, travel, views. Bookmark the permalink.